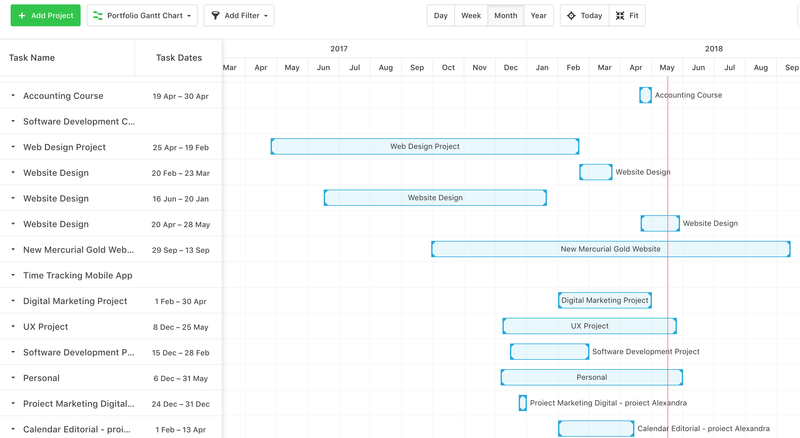 The Gantt Chart is one of the most popular technique used in Project Management for scheduling, monitoring and adjusting projects. The Gantt Chart shows you how activities and tasks are displayed against time and it offers answers to critical questions like: “What needs to be done?“, “When does a task start and when its scheduled to be completed?“, “Which activities overlap and what are the connections between tasks?” or “Who is the person responsible for a task?“. If you’re not familiar with this technique, you can learn more about Gantt Charts in our Academy. In Paymo there are 2 ways of using Gantt Charts: the Portfolio Gantt Chart, where you can see the schedule for all the active projects and the individual Gantt Chart for each project. In order to access the Gantt Chart for a particular project, go to Projects → choose a project → Tasks → and change the view from Simple/Table view to Gantt Charts.